Born: 31 July 1882 Drouin. Died: November 1962 Heidelberg. Enlisted: 25 August 1914 aged 32. Served: Egypt, Gallipoli and Western Front. Known as “Ern” or “Gabby”, Ernest was a son of Captain John Norcliffe and Marion (Marian) Gabbett, who lived around Drouin and Warragul, where both Ern’s father and his maternal grandfather were prominent pioneers. Ern attended Drouin State School. Later, the Gabbetts moved to the Mornington Peninsula, then Toora in South Gippsland where Ern farmed with his father. In 1902, Ern volunteered for the Boer War in South Africa, serving as a bugler. 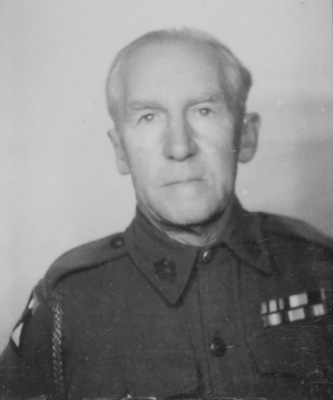 His father had been Commanding Officer of the Victorian Mounted Rifles (VMR) at Warragul. After the Boer War, Ern returned to Drouin, where in 1909 he was working as a grocer’s assistant. Ern later established his own store in Garfield, which in 1914 was spectacularly burned down in a fire that also destroyed the neighbouring pub. Ern was also well known as a footballer, playing for Iona. Ern married Eveline Victoria McKay in 1913. The couplelived in Brunswick when Ern enlisted for the AIF on 25 August 1914, just weeks after the declaration of war. Ern departed Australia on 21 October 1914 and found himself on Gallipoli until it was evacuated. In March 1916, Ern was transferred to France to serve on the Western Front, where he supported the 1st Division AIF with howitzers, including during the Battle of Pozieres. On 31 July 1917, the 2nd FAB took part in the beginning of the British attack which launched the Third Battle of Ypres. The 4th Battery had five guns in action and Ern was wounded in action that day, suffering a wound to his arm and hospitalized for a few weeks. In late September, Ern was given a month’s leave in England, returning to the 4th Battery just before it sustained heavy casualties at Anzac Ridge during the Battle of Passchendaele. In September 1918, Ern left Taranto Italy for special “1914 Leave” in Australia, which was arranged for the original Anzacs of 1914. He arrived back in Melbourne on 25 October 1918, just a few weeks before the war ended. While Ern was away, Eveline had moved to Pakenham, where his mother Marion lived. Eveline established a drapery business in town. In late 1918, Eveline purchased Robert Clements‘ shop and house in Main Street, opposite the old shire chambers. After the War, Ern worked as a tailor in the family drapery business and became actively involved in a number of community organisations and activities. He played football for Pakenham, being described in 1919 as a “very useful man for the team” and was an accomplished musician. He performed with a Miss Lewis at the last soldiers welcome home held at Pakenham in May 1920 and established “Gabbett’s Orchestra” which performed at dances and balls in the district. Ern was also described as “probably the most talented amateur actor this district has ever known”. He was a prominent member of the Pakenham Dramatic Club and organised a minstrel group which raised a lot of money for the Pakenham Fire Brigade. Ironically, the first fire the Pakenham Fire Brigade ever had to fight was one that broke out in Ern’s shop in April 1930. The entire contents were destroyed by fire and water.